2015 - July - Dec.
2014 - July - Dec.
2013 - July - Dec.
2012 - Jan. - Apr. 2012 - May - Dec. Call to schedule your own private class at your preferred time! $25 due the day of class. Learn about the field: education requirements, licensing, job possibilities. Try out hands-on practice by learning a basic back massage. Use professional equipment and get real guidance from an expert! 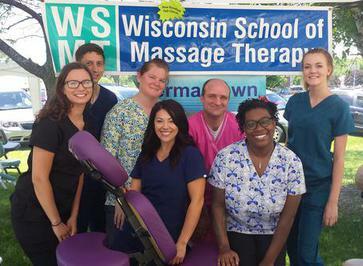 Find out if you might want to become a Wisconsin Licensed Massage Therapist. If you are worried about the job market, don't! The US Bureau of Labor Statistics states, "Employment of massage therapists is projected to grow 22 percent from 2014 to 2024, much faster than the average for all occupations. Continued growth in the demand for massage services will lead to new openings for massage therapists." The Department of Veterans Affairs has classified massage therapy as a "high-demand occupation" and reclassified it as a program which qualifies under the Veterans Retraining Assistance Program. ​Have you noticed the natural health movement? More and more people are beginning to take charge of their health. They are seeking quality nutrition, more movement, and real healthcare. Massage therapy is proving to be an important part of this growing demand for natural solutions to health problems. It is satisfying to have the professional skills to help people grappling with musculoskeletal pain, range of motion restrictions, stress-related disorders and more. At WSMT we are excited to get our 2019 classes off the ground. You can join us and become a professional massage therapist in as little as 6 months! You can be in the driver's seat for this wonderful work once you complete your training and obtain your state license. We're here to help you make your dreams come true. Or maybe you are not quite ready. You don't feel that you have enough information. Then maybe you want to join one of our Introduction classes. Check out the information at the right. Try your hand at real massage work, coached by a real expert - me! Like us on our Wisconsin School of Massage Therapy Facebook Page!